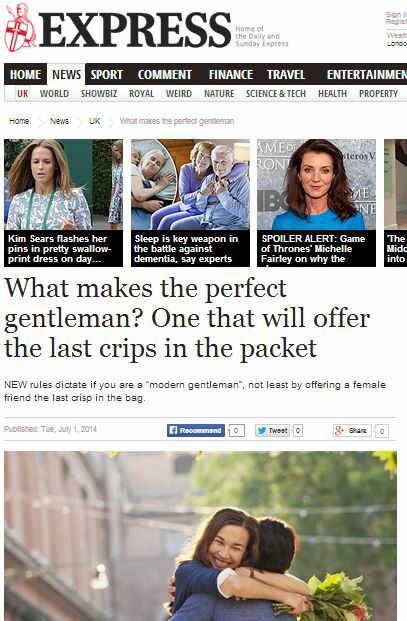 NEW rules dictate if you are a “modern gentleman”, not least by offering a female friend the last crisp in the bag. Taking a woman’s car for an MoT and recording favourite television shows are other etiquette pointers, says a poll of 2,000 women. A true gent will avoid disturbing his woman by sleeping in the spare room after a night out and will watch football on a laptop so as not to hog the TV. A spokeswoman for florists SerenataFlowers.com, which ordered the study, said: “The definition of a gentleman has definitely evolved. “But showing consideration even in the smallest way has a positive effect on relationships. This entry was posted in SerenataFlowers and tagged bianca london, daily express, daily mail, SerenataFlowers on July 4, 2014 by Michael Marshall.